Poet, hymn writer and country parson, Frederick William Faber was Rector of a Huntingdonshire parish for three years, but later converted to Roman Catholicism. He was a friend of John Henry Newman and an adherent of the Oxford movement. 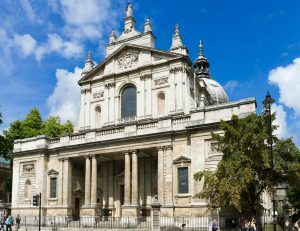 Disenchanted with the Church of England, he suddenly left All Saints, Elton, to join the Catholic Church and found a religious community – a branch of which he later established as London’s famous Brompton Oratory. When Frederick Faber decided to take Holy Orders in the Church of England, the poet William Wordsworth (1770-1850) wrote to him, “I do not say you are wrong, but England loses a poet”. Thomas Faber, was vicar. He was the seventh child in the family and his father was the Bishop of Durham’s secretary. He attended Bishop Auckland grammar school for a short time, but spent most of his boyhood in the Lake District, where he studied privately. His poetic aptitude and passion for writing were awakened by the magnificent countryside – rocky fells, woodland, lakes and moorland. Before going to Oxford University he spent five years at Harrow School. He matriculated at Balliol in 1832 and two years later became a scholar at University College where he graduated and in January 1837 became a fellow. Faber was of Huguenot descent and his family had sympathy for John Calvin’s fierce reformation beliefs which denounced the priesthood, sacramental theology, and Roman Catholic doctrine. During his university days, he was torn between the Calvinistic views of his youth and the developing Oxford Movement which aimed to bring the Church of England back to its Catholic roots. Eventually the latter triumphed, and Faber became an enthusiastic follower of John Henry Newman (1801 – 1890), a major figure in the Tractarian Movement. In 1839 he was ordained into the Church of England, and took work as a tutor, twice travelling to the continent. His letters, which contain poetic descriptions of the places he visited, conveyed his passion for Catholic rites and devotion. He published a book called Sights and Thoughts in Foreign Churches and among Foreign Peoples, which he dedicated to his friend Wordsworth. 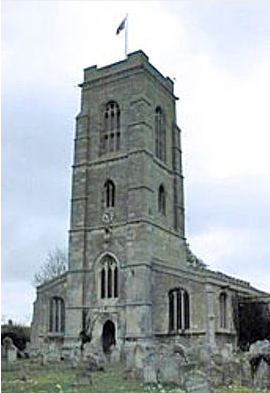 In 1843, he was appointed Rector of Elton, in Huntingdonshire. When he arrived the Methodists, who were strongly represented in the parish, crowded his church “ready to catch the Rector in his Romanism”. Many of his parishioners were reputed to be “living in sin”. Before his appointment he had started corresponding with Newman, and soon after his arrival he travelled to Rome to learn from the Catholic Faith how to carry out his priestly duties. Despite his Catholic leanings, he became very popular with his parishioners. He was a lean, eccentric man with a pale complexion. He was often seen in the village wearing a broad white choker and tall hat and he always preached eloquently in his white surplice and Oxford black and red hood. Faber never married. At first he lived alone, cared for by seven servants, but gradually other young male friends joined him. Faber and his friends began to think of themselves as monks and the rectory as a kind of monastery. He established the observance of saints’ days and the hearing of confessions in the parish church, preached Catholic doctrine, and wrote the Life of St Wilfrid, openly advocating the claims and supremacy of Rome. Few people were surprised when, after his prolonged mental struggle, he left Elton to follow his hero Newman and join the Roman Catholic Church in November 1845. Faber and Newman had very different personalities. 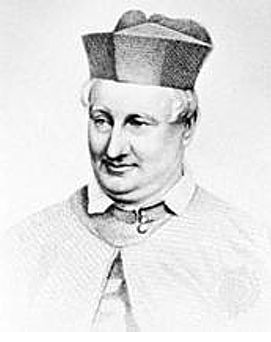 Newman was a more reserved person who sided with the “old Catholics” that had remained loyal to the Church during the persecutions. Faber, on the other hand, was much more extrovert, expressed his sentiments, and was drawn to the continental Catholicism of France and Italy. It soon became apparent that his attraction to Newman was one-sided. In 1849 he founded the London Oratory based at a former gin shop in King William Street and within a year it became independent of the Birmingham Oratory. The Oratory moved to Brompton Road, South Kensington in 1854, and later became known as the Brompton Oratory. There Faber spent the remaining nine years of his life. In spite of his poor health, he crowded a huge amount of work was into those years. He published a number of theological works, and edited the Oratorian Lives of the Saints. He was a man of considerable charm. But it is as a hymn-writer and First Provost of the London Oratory that Faber is best remembered. As a Catholic writing for Catholic adherents, Faber expressed intense and personal religious feeling in his hymns. Even so many of these are still sung by Protestant congregations today. Readers may recall some of his well-known hymns such as My God how wonderful thou art, There’s a wideness in God’s mercy and The Pilgrims of the Night. In his latter days, he grew distressingly corpulent, but did not complain of his physical degeneration. Everyone who met him continued to find his personality strangely fascinating. He died on 26 September 1863 at the age of only forty-nine. He was buried in the Roman Catholic Cemetery in Rednal, South West Birmingham. Faber never lived to see the new Brompton Oratory building, which was consecrated on 16 April 1884, and still stands today. Faber was the great-uncle of Geoffrey Faber, co-founder of the publishing house Faber & Gwyer which later became Faber & Faber, a major publisher of both literary and religious works including writers such as T. S. Eliot, Ted Hughes and William Golding.